In 2013, a federal court found the NYPD’s stop-and-frisk practices unconstitutional. NYC's current mayor, Bill de Blasio, ran on a platform of addressing racial disparities in policing that same year. Yet in 2018, five years later, unconstitutional and abusive stops by the NYPD continue, impacting mostly New Yorkers of color. On July 9, 2018, CPR filed an amicus brief with support from over 90 other organizations—including NYC community, civil rights, legal and faith organizations—urging the federal court to mandate key reforms demanded by impacted community members. It’s time for the NYPD to stop ignoring communities and the Constitution. The court should mandate implementation of these changes and bring more justice and safety to all New Yorkers. 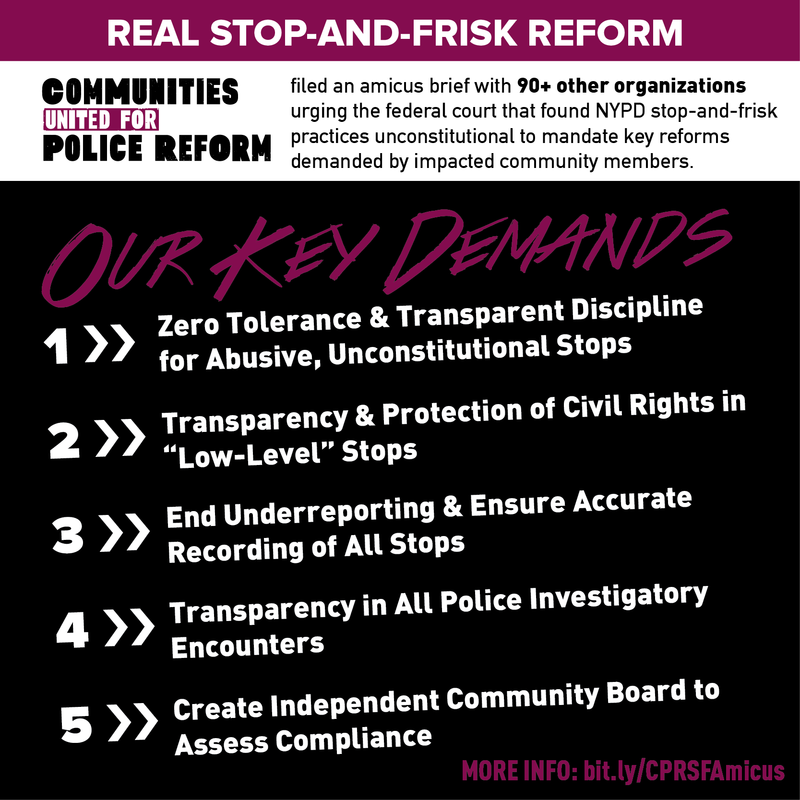 Click here to learn more about CPR's amicus filing and our key demands. Click here to read letters from named Plaintiffs supporting CPR's demands and reforms of the joint remedial process. The letters are written by: David Floyd, lead named plaintiff, and Lalit Clarkson, named plaintiff, in Floyd, et al. v City of New York; and Jacqueline Yates, named plaintiff in Ligon v. City of New York. Click here to read Associated Press news coverage of the filing and visit our "In the Media" page for even more coverage.